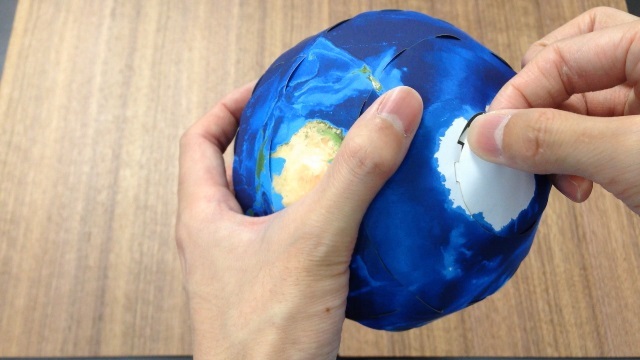 Let's make the lunar globe! 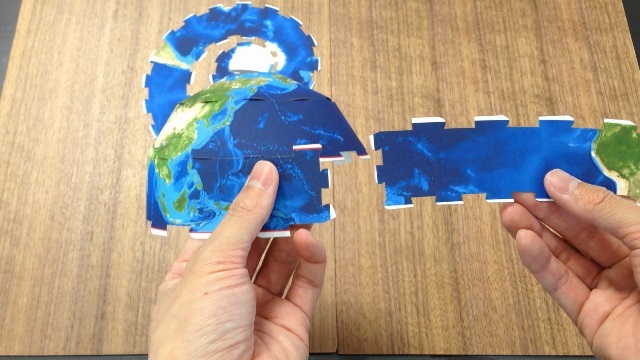 This paper craft of the Moon is easy to make. 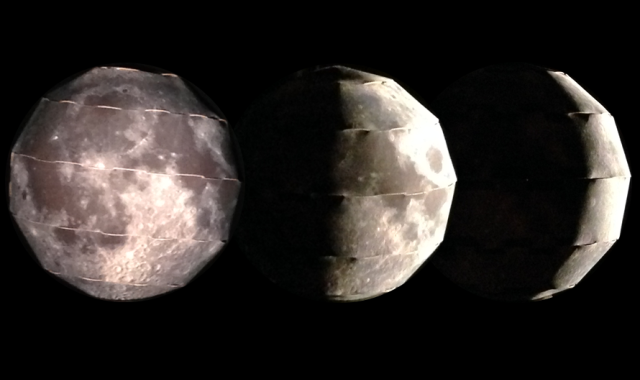 You can also simulate lunar phases. And please check out the back side of the Moon which you can't see usually. You don't need glue nor tape. Only you need to do is just hooking the parts each other. I wrote a program to calculate the developable surface which tangents to the sphere at the points of the spiral curve. 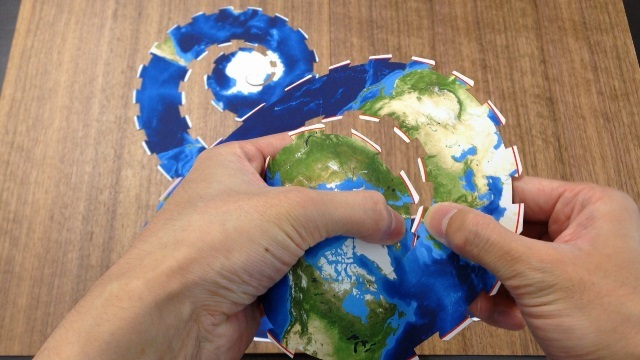 Then I mapped satellite image of the earth. You can make it without glue nor tape. 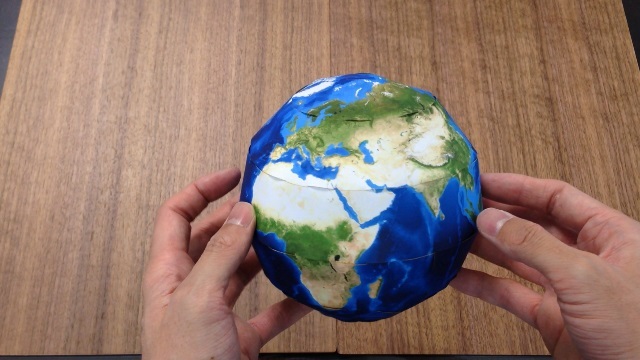 Let's print 360-degree photo on a sphere! You can order printing photo taken with RICOH THETA, Google Photo Sphere or others. First, please upload the exported image file here and check how it will be seen if you make it. Then please order with "Image file code". 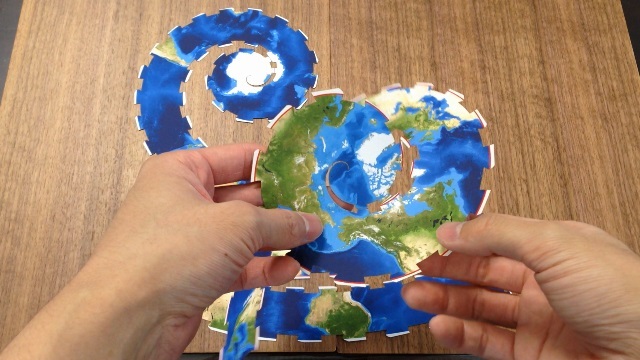 How to make the globe or the sphere with the developed surface like an apple peel. This movie explains how to make it. 1. Start from the parts with red line on the side. Start from the "North pole". 2. Hook the edge one by one. 3. Hook the next parts after one part is finished. 4. "South pole" is the last. 5. Check the whole shape and it's finished! Be careful not to make a crease. Be careful not to make it wet. After finishing, please check north and south pole again. Please see the movie how to complete. Start from "North pole" is recommended. It will be harder if you start from "South pole" because the shape of the hooks are different. Be careful not to expose it to sunlight. The color tends to be fade out in ultra violet light.